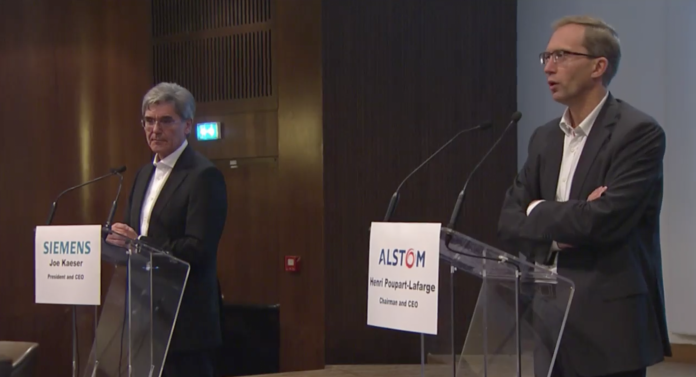 Alstom CEO Henri Poupart-Lafarge (R) takes questions from the world's media following the Siemens Alstom merger announcement in September. Credit: Siemens Alstom. On September 26, 2017, Siemens and Alstom confirmed they had signed a memorandum of understanding to combine Siemens’ mobility division with Alstom’s transport business, forming Siemens Alstom. Following the announcement, the two companies held a joint press conference to address the world’s media and explain why the two rail giants are combining, future plans and what’s next. Why are the two companies merging? Poupart-Lafarge: “I had the opportunity to tell you in the past a number of times that… there was a need for the consolidation of the industry and, at the same time, I was telling you that there was no [need for a] do-or-die type of merger, no emergency to do anything because Alstom in itself was enjoying a great dynamism, a great momentum in a growing market. We are not in a market that is shrinking. “When we came to this opportunity of creating this new global leader, the opportunity had to be seized. When we did the internal review, we looked what was the best fit for Alstom; Siemens was first by far. It’s a review we did internally within the management and board of Alstom, everyone was in agreement that this combination with Siemens Mobility was the perfect match. “There are two main trends on our market: the globalisation of our market, which means that the market is not only in Europe or the US, it is more and more in all countries in the world, which creates lots of opportunities for us but at the same time creates a number of new competitors such as Chinese, Japanese, Korean, all sorts of new competitors. This requires lots of investment to be everywhere on all continents. What does the transaction mean for Europe? What is Siemens Alstom’s vision? Is this deal a response to CRRC’s growth? Poupart-Lafarge: “First of all, of course CRRC, the new Chinese competitor, is extremely strong and has changed a little bit the picture of the market. At the same time you have other competitors and this company aims at being a global leader of all the market regardless of whether the competitor is Japanese, Chinese or coming from different places. What matters in this industry is customer proximity and innovation, and this is exactly what this merger will bring. This is clearly something on both sides where we are advanced as compared to some of our competitors, in particular to the one being quoted, CRRC. Yes, it is an answer, but no of course we are not going to stand idol doing nothing, we need to continue to progress, we need to continue to innovate, we need to continue to invest…. It’s one answer, it’s not the final answer; there is a lot of work to come. Why was the deal seemingly concluded so quickly? How was the company name chosen? Is there a risk that anti-trust authorities will stop the deal going ahead? Will Siemens Alstom merge with Bombardier in the future? What next for the new company? What effect will the merger have on the new Technology Centre, recently opened by Alstom at Widnes? There was talk that the site could also become a new train building factory which, if it went ahead, would now give Siemens a facility in the UK which up to now has been lacking. My personal question question is about what would happen to their products, especially in terms of rollingstock, cause that could make or break the merger and its subsequent success. Take the Vectron and the Prima, the locomotive designs for Siemens and Alstom respectively. The Vectron has been selling like hotcakes, with loads of buyers and/or leasers and currently approved for operation in 14 countries. The Prima on the other hand, has only been sold to Morocco. So if the new company ditches the Prima, that could be a big success, but ditch the Vectron and the groundwork would have to start all over again, potentially breaking the entire locomotive market for the new company. Alstom is currently rendering around a half of its UK signalling staff redundant, and the Alstom Academy in Widnes looks set either to close (having been subject to a land grab by the Preston office), or, at best, to be left as a body with a much reduced scope. The former has been attributed to a lack of work from Network Rail, but the conspiracy theorists also see it as a reduction in headcount that is easier to do now than after merger with Siemens. All of this is, of course, not publicly acknowledged in Paris, which remains relentlessly upbeat about business everywhere on the planet, except for the UK, on which it is conspicously silent. There are around 250 very angry signalling engineers looking for work about now.